As fate would have it, the Mets faced many more, and bigger problems than the bullpen in 2009. Injuries to top players, awful starting pitching, mental lapses, and terrible fundamentals overshadowed the fact that K-Rod was a disappointment. No one can blame Frankie Fantastik for falling short of another 60-save campaign — he had only 42 save opportunities. But he DID match another save figure from his record-breaking campaign — 7 blown saves. More alarming, his ERA increased by a run and a half, and his losses doubled. Usually, pitchers who move from the AL to the NL enjoy an improvement in their overall numbers. Not so for K-Rod. A few reasons can explain Frankie’s inauspicious NL debut. The most obvious is he is starting to wear down — though only 27, 2009 was his seventh full season as a big-league closer. When in his early and mid-20s, K-Rod’s fastball consistently rode in the 95-97 MPH range, occasionally flirting with 98. This past year he was usually in the 92-93 range, touching 95 every once in a while. K-Rod claims the drop in velocity has to do with improving his command and masking his outstanding change-up. Maybe so. The raw stats tell us that he’s giving up about as many hits and walks as he always did — his 1.30 WHIP in ’09 was nearly identical to the 1.28 mark posted in ’08. One thing jumps out, though — his average pitches per inning jumped to 18.3, from 17.1 in ’08 and a career average that was previously in the low 16s. Bottom line is that Frankie always allowed too many baserunners, but now he’s having a slightly harder time pitching out of those jams. Even with a slight drop in velocity and slight increase in hittability, K-Rod is still among the elite closers in baseball. The key to his success is in the way he’s managed. Under Mike Scioscia, Rodriguez almost never was asked to pitch more than three outs — in fact he never retired more than three batters in 2008. Further, Scioscia didn’t like to use Rodriguez three games in a row. Jerry Manuel, on the other hand, had K-Rod pitch multiple innings four times during the year, and used him FOUR games in a row on two occasions in the month of May. In 2008, K-Rod exceeded 28 pitches in an outing only once. In 2009, he threw 30 pitches or more 7 times — including two appearances of 40+ pitches. The Mets have K-Rod for at least another two years at $11.5M per annum. 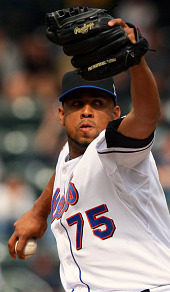 What many forget, though, is he’s a near-lock to be a Met in 2012 as well — at age 30 and for $17.5M. That option is guaranteed if he finishes 55 games in 2011 and 100 games total between 2010 and 2011 (he finished 66 games this past season), and is “declared healthy by doctors”. That’s a substantial investment — one worth protecting. I’m an advocate of changing mechanics if a) they are obviously incorrect and potentially harmful; or b) the player is coming off an injury caused by poor mechanics. K-Rod’s mechanics do look violent, but they’re actually not too bad. For the most part, he stays on a straight line toward the plate and his elbow is at a safe level throughout the motion. Much of his velocity comes from generated momentum, which is good. What I don’t like about his mechanics is his front knee locks and his upper body stays up through the release and follow-through, which means he’s putting a lot of stress on his shoulder during deceleration. My guess is that at some point he’s going to have problems with his labrum and or his front (left) knee, because both are taking the brunt of the follow-through. If I were his coach I might try to get him to collapse that front leg a bit and/or get his head to continue pushing forward toward the plate after release. But, he’s been doing this and remained healthy for 8 years, so it’s hard to convince anyone a change is in order. The most worrying part of this write-up, and indeed all the bullpen write-ups is the total overworking of these players by Jerry…That paragraph about Scioscia sums it up entirely. What Jerry needs to do is get a wallchart and WRITE DOWN who pitches and when, and then take some time to ensure he isn’t wearing guys out with his matchup obsession. Joe – your Bullpen Bulletin made for some eye-opening reading regarding this problem and the comparison of the Mets and other teams. Does Dan Warthen have any influence on this stuff? Or a pitching coach in general? Don’t forget that Frankie participated in the WBC. He was cranked up to “eleven’ back in early March, when he should have been gradually building arm strength. Frankie appeared to jump the shark in late June, right after Castillo’s miscue against the Yanks. Remember the meltdown against the Orioles for his first real blown save? The wheels came off right after that as he wasn’t the same pitcher for the remainder of the season. By August, he was out of bullets. That’s because August felt like October on his arm and body. The Mets had 17 players participate in the WBC. They also had 20 players on the DL this season, including WBC participants Reyes, Beltran, Delgado, Putz, Ollie Perez and Frankie. Coincidence ?? ?